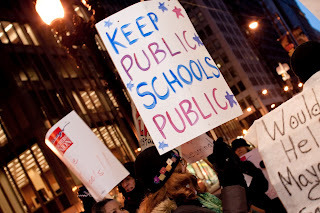 Tonight, Feb 22, 2012, at about 6:15 PM, the appointed Board of Education of the city of Chicago closed, phased out, and turned around all 17 schools on their chopping block without a dissenting vote and hardly a blink of an eye. Despite protests ranging from the sleepover on the sidewalk and mic-check takeover of the Board meeting in December, the 4-day sit-in at the mayor's office, the occupation of Piccolo school, the 500-plus person candlelight vigil to the mayor's house Monday night and the dozens of hearings, speakouts, and organizing meetings around the city where parents, students, teachers and community member poured out their hearts, developed plans, and were deeply involved in our children's education--this Board callously ignored the wisdom and love of Chicago's people. Even though we knew it was coming, we were deeply hurt and angered. They gave six schools to the very politically connected AUSL, rapidly on its way to building its empire in Chicago (now 25 schools) and soon to go national. As Jitu Brown of KOCO told the press immediately after the so-called vote, "only in Black and Brown communities would this happen, not in Winnetka or Oak Park." This is a deeply racist city, where the 1% ignores the knowledge and experience of its residents about the education of their children, overwhelmingly of color in Chicago public schools (92%). 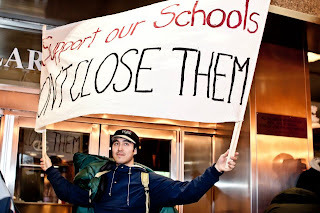 We need an elected and representative school board, elections with spending limits, and bottom-up, community-driven plans for real school transformation and community control of schools. And we need real popular political education, as to the nature of what we're up against. 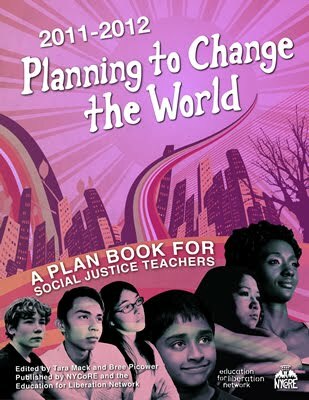 This is a business plan, hatched by the 1%, for the 1%--not an education plan. We have much work to do, in educating and organizing ourselves. This fight is far from over, and we will continue to fight it in the streets, courts, legislature, board rooms, classrooms, schools, media, and everywhere else. To quote our brother in the struggle, Adourthus McDowell (look at the mic-check video! ), "THESE ARE OUR CHILDREN! NOT CORPORATE PRODUCT!" As a network of Teacher Activist Groups (TAG) we believe that education is essential to the preservation of civil and human rights and is a tool of human liberation. In alignment with these beliefs we are are proud to coordinate a month of solidarity work in support of Tucson’s Mexican American Studies (MAS) Program. In January, 2011 state attorney general Tom Horne declared that the TUSD MAS program is illegal. Over the past year, teachers, students, and administrators have come together to challenge Horne’s ruling, but on January 10, 2012, the Tuscon Unified School District school board voted 4-1 to cease all MAS classes immediately for fear of losing state aid. In the month of February we invite you to strike back against this attack on our history by teaching lessons from and about the banned MAS program. On this website you will find a guide that includes sample lesson plans from the MAS curriculum as well as creative ideas and resources for exploring this issue with students. Whatever happens in Arizona, we can keep the ideas and values of MAS alive by teaching about them in our classrooms, our community centers, our houses of worship, our homes. February 1 is the first day on which TUSD must be in compliance this law. It is also the first day of African American History Month. And as Dr. King warned us, “injustice anywhere is a threat to justice everywhere.” What is happening in Arizona is not only a threat to Mexican American Studies, it is a threat to our right to teach the experiences of all people of color, LGBT people, poor and working people, the undocumented, people with disabilities and all those who are least powerful in this country.